Application of hot and cold to the surface of the body is well known to be valuable in healing. The temperatures affect nerve responses that translate the input to the circulatory, digestive, and pain systems to improve function and comfort. connective tissues and congestion in the lymphatic flow. has been used traditionally worldwide for relaxation and detoxification. Modern medical research has been confirming and detailing its benefits for years. In addition to immune stimulation, hyperthermia is valuable for cardiovascular recovery and maintenance, skin health, and the nervous system. Published studies include cardiovascular and immune effects. Our state of the art equipment provides far infrared heating that warms the body from the inside out. We provide a carefully managed therapeutic approach that complements individual needs, goals, and tolerances. This mat emits far infrared heat, light exposure with red LEDs, and PEMF low frequency magnetic field pulsing. 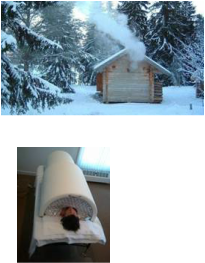 One or more of these functions can be employed while the mat is used in conjunction with the sauna capsule or on its own. Steam bathing can deep clean and moisturize skin, moisten mucous membranes, promote sinus drainage, relax muscles, improve circulation, and relieve dehydration in general. Steam can gently deliver the support of essential oils to the respiratory surfaces and the skin while pores are open and circulation is activated. Alternating steam with cooling showers is refreshing and invigorating. Several synergistic functions are contributed by our hydrotherapy. The shower massage stimulates the skin surface nerves, increases circulation, and relaxes muscles. The therapeutic tub also offers hydromassage, and in addition it offers detox soaks with salts and aromatherapy through the air whirlpool jets. Aromatherapy can be defined as the art and science of utilizing naturally extracted aromatic essences from plants (essential oils) to balance, harmonize and promote health of body, mind and spirit. We combine pure and ozonated oils with our modalities to enhance the individual's experience and healing process. Oxygen is offered to take advantage of the increased circulation in the sauna. Enhanced oxygen stimulates responses in the body that can assist Access TherapyTM and other physiological processes supportive to recovery. deep connective tissues and ligaments of the trunk. move, it also stimulates the metabolism and assists innate detoxification.